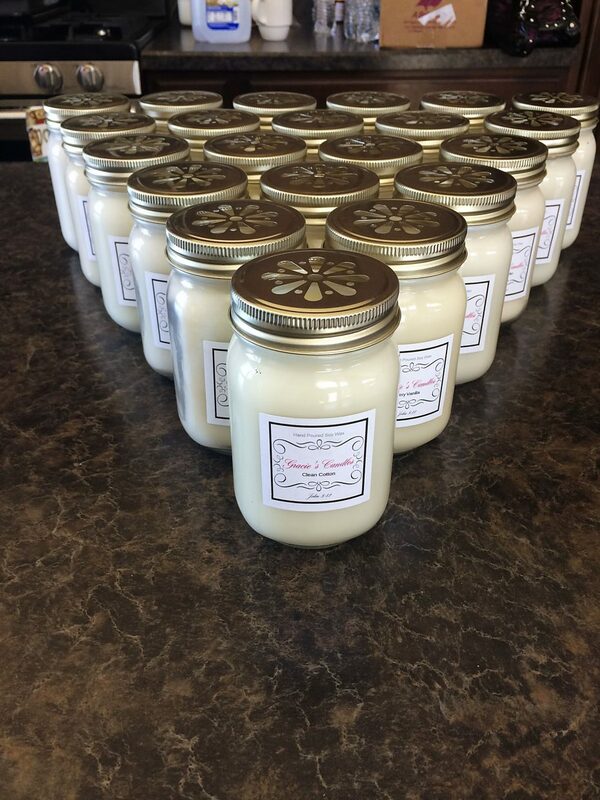 Brown offers 26 different scents of soy candles. Maddison Brown poses with all the candles she made after a long day. Maddison Brown's booth is open for business at a craft show. 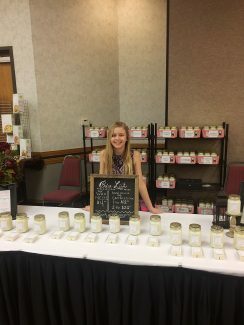 Maddison Brown making soy candles that she sells at vendor shows and through other businesses. 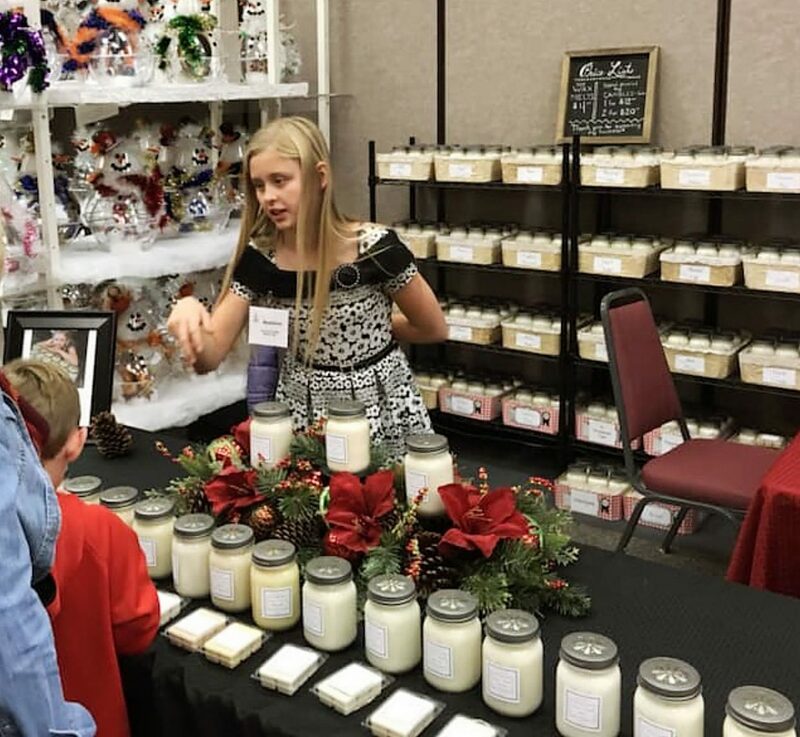 Maddison Brown helps customers at one of the vendor shows where she markets her candles. 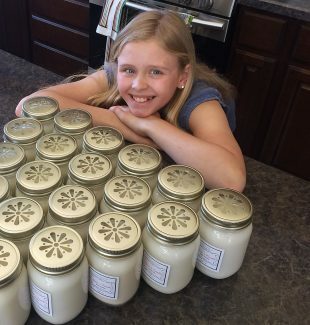 Maddison Brown started making candles nearly two years ago when she was 10 years old. 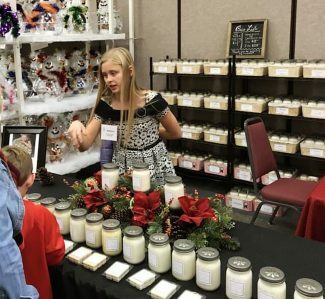 Tucked amongst displays of glittering snowmen, stuffed teddy bears, holiday jewelry and jolly Santa's is a young entrepreneur who started her own business nearly two years ago making soy candles. 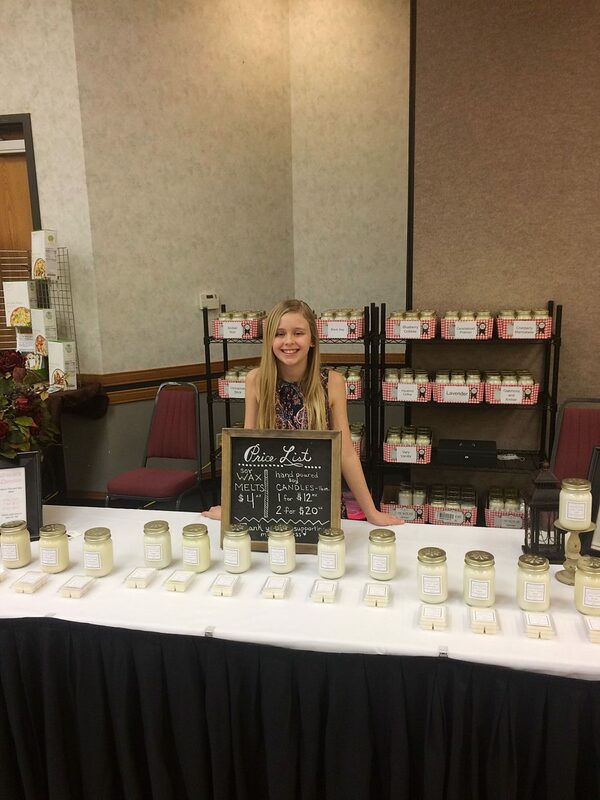 "I like to make candles because it makes everyone who buys them happy, and that makes me happy," said 12-year-old Maddison Brown. Brown, who lives in the small town of Morrill, Neb., was one of nearly 100 vendors at the annual Gering Civic Center Holiday Craft Fair in November. What is unique about Brown is she was the youngest vendor of the participants who came from multiple states to participate in this year's event. Brown first approached her parents, Jeremiah and Heather Brown, about starting the business after garnering support from her mother's best friend, who has a candle-making business in Omaha. "She told me if I researched candle making to learn something about it, she would teach me how," Brown said. "What I learned is I should use hand-poured soy wax because it burns longer, has a stronger scent and burns cleaner," she said. After discussing the prospect of starting a business with her parents, they gave her their total support and a start-up loan. "Maddison has always been a go-getter," Heather said. 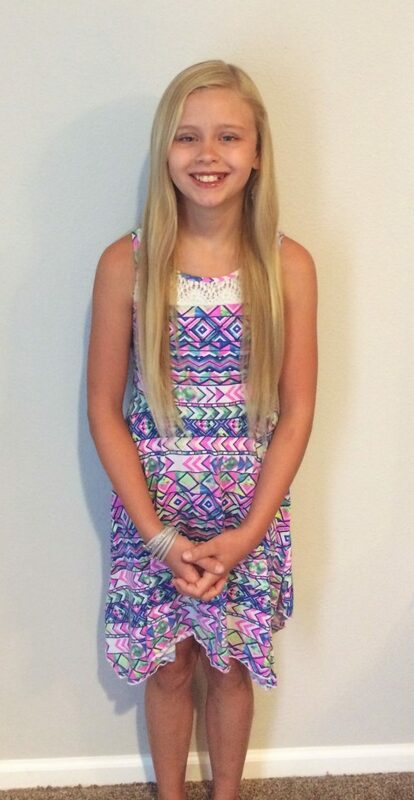 "She is a very responsible young lady, and makes being a parent easy. When she first asked us about starting a business, we didn't think twice. We knew she would put her all into it." Shortly after that, Brown started Gracie's Candles. Since then, she has put most of the money back into her business to help it grow. "Last year, I donated a portion of my profits to Hepatoblastoma research," she said. Hepatoblastoma is a rare form of liver cancer that occurs in children and infants. 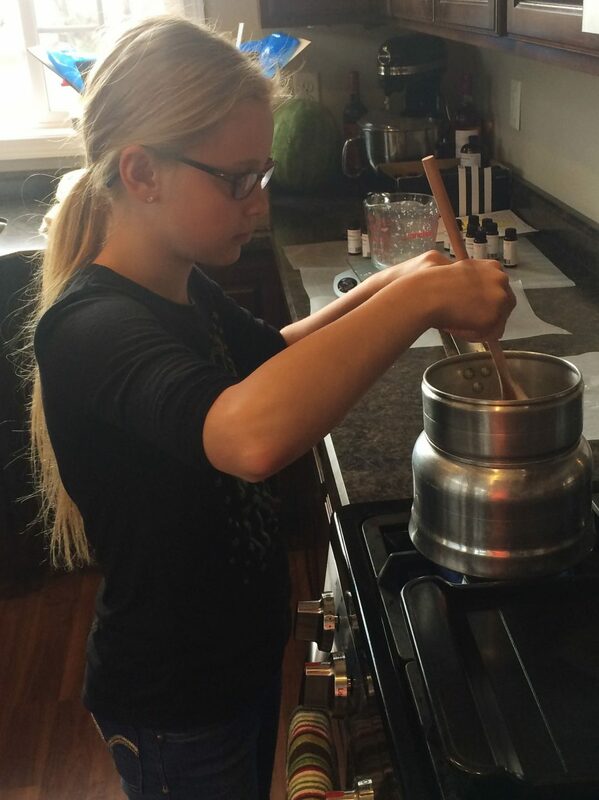 She also purchased an industrial wax melter, which has allowed her to make 150 candles per batch. "It takes nearly all day to make that many candles," she said, adding that before she purchased the wax melter she could only make 30 at a time. Choosing scents that appeal to her customers has been a challenge, but she tested her ideas on friends and family to gain feedback. "The scents are seasonal. Since it's Christmas, Cranberry Marmalade and Mistletoe Kisses have been big sellers," she said. "But, my personal favorite is Pumpkin Souffle. People also ask for Vanilla Lavender, which is one of the scents I developed all by myself." 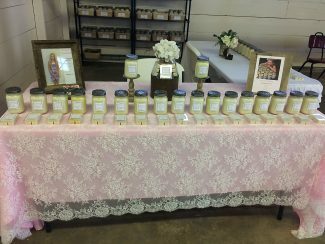 Brown has sought out vendor events, and approached merchants about marketing her candles in their stores. The candles are available at The Flower Basket in Main Street Market and Elysian Salon in Scottsbluff, and U Save and C Reflection in Morrill. She also sells candles on her facebook page. The business has grown faster than Brown expected, and with the new wax melter, she can fill larger orders. "I hope to start shipping and selling candles online next year. 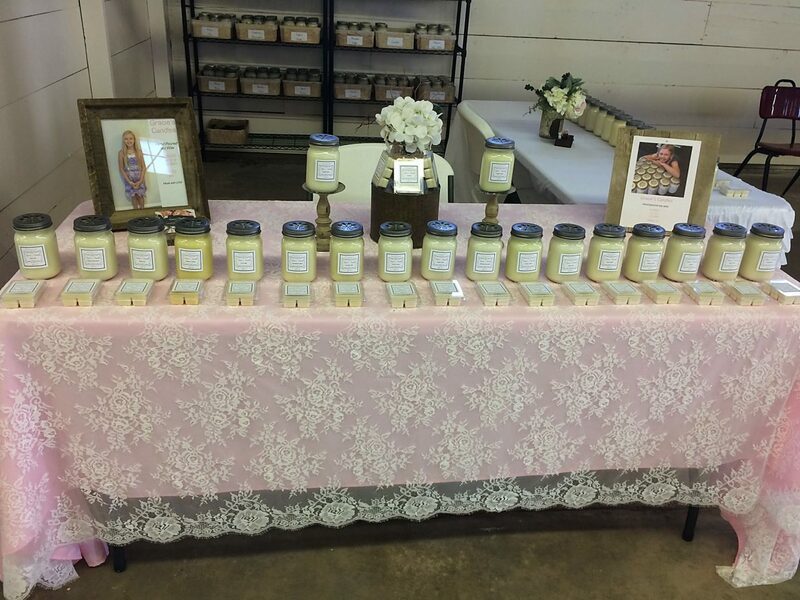 My ultimate goal is to sell candles in stores all over the United States," she said. Her next step is to produce enough inventory that she can participate in a large vendor show in Denver. As her business grows, Brown is learning things some children don't learn until they are an adult. "By having my own business, I have had to learn about taxes, being a salesman and running my own business," she said. "To succeed, I've learned I have to work hard and be diligent." It's not always easy. "Some of the shows I have went to haven't had a good turnout," she said. "The taxes are also hard for me to understand, but I am working on it." Despite the successes and challenges, Brown said she would encourage other children to consider starting their own business. "If I was asked for advice, I would tell them that even if all things don't go as planned, they should keep trying and never give up," she said. The obstacles have been easier to overcome because of the support she receives from her family and loyal customers. "I am really thankful for my family," she continued. "Without their support, I wouldn't have been able to do this. My little brother, Jacob, helps me label the jars, and some days, he helps me set up at shows. My dad is in the process of building me a candle shop, and both my parents take me to the shows, help me set up, and sit with me." Her parents are very proud of what she has been able to accomplish in such a short time. "What we didn't expect were all the valuable life lessons she has learned in this process," Heather said. 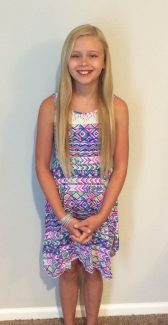 "Her father and I are extremely proud of Maddison, and blessed that so many people have supported our little girl."